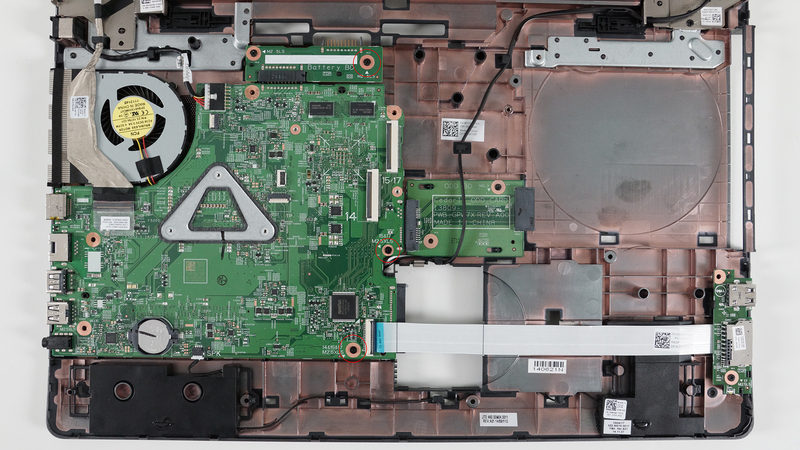 Dell Inspiron 5749 is one hell of a workstation, but maybe not in the good way. It’s really big, expensive and bulky. Soon you can expect detailed review on the model, but for now you should settle with this short upgrade and disassembly guide. 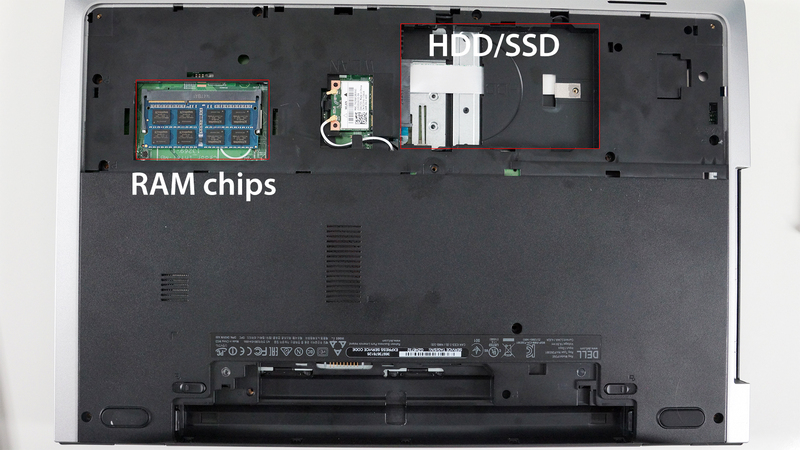 We have to note that the Inspiron 5749 has a really thick construction and it’s really heavy too, but at the same time doesn’t offer anything special. There’s no M.2 SATA slot, nor a second SATA 3 slot for an extra HDD or SSD. 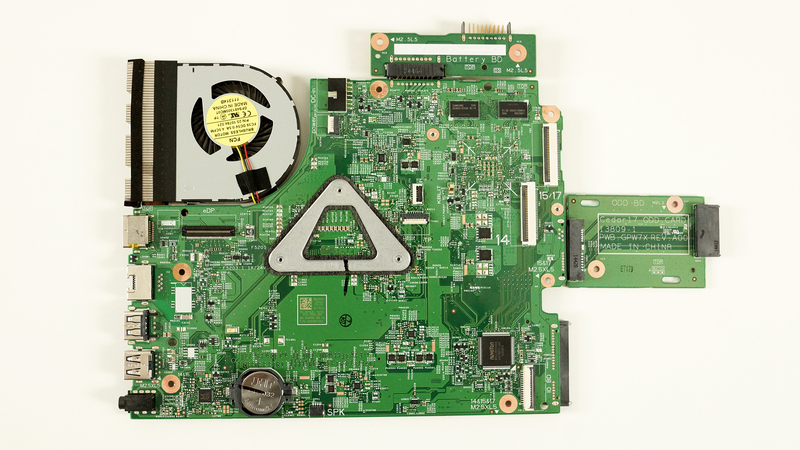 In fact, the chassis contains only a motherboard suitable for 15-inch laptops with two extensions. The rest can be seen in the photos below. 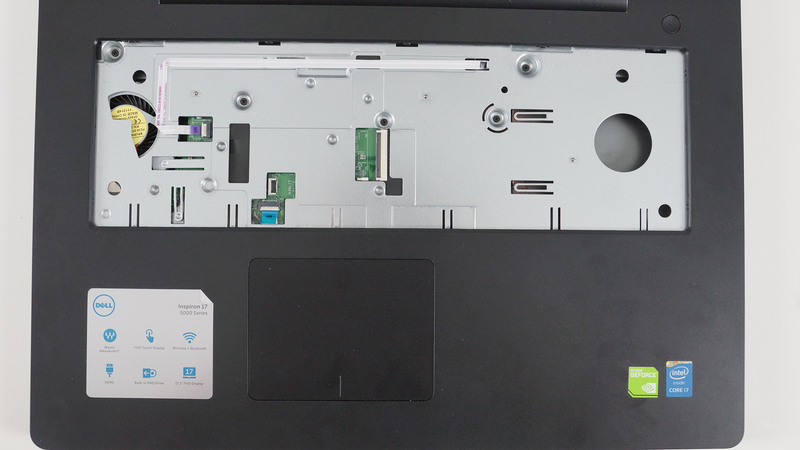 At the back, you will find a little cover held by two screws and beneath it you will find the HDD, RAM chips and the Wi-Fi module. Practically all you need for the usual upgrade, so no hassle here. Also, the battery is user-replaceable, which is also a plus. 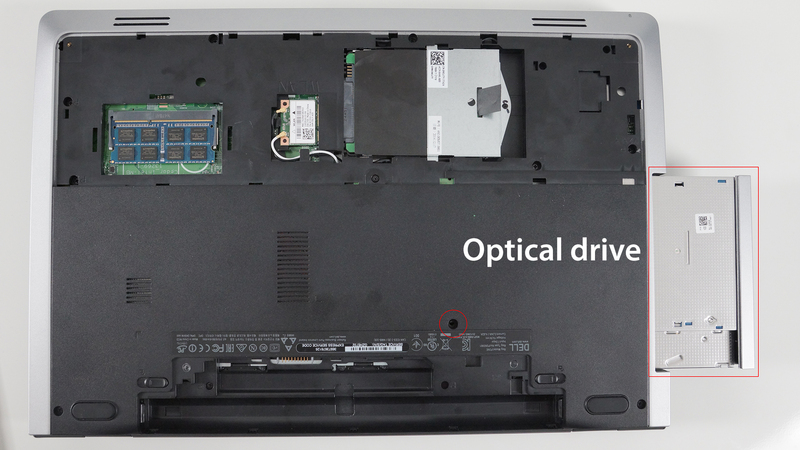 The optical drive is kept in place by one screw (see the picture below) and you will need to remove it if you want to get even further and clean your motherboard or CPU fan. This will be explained in the following steps below. 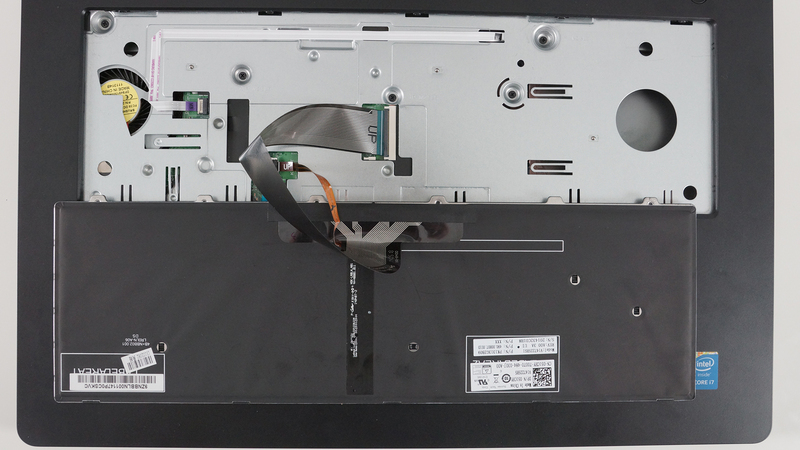 Under the keyboard, Dell has placed 5 screws which keep the motherboard intact. 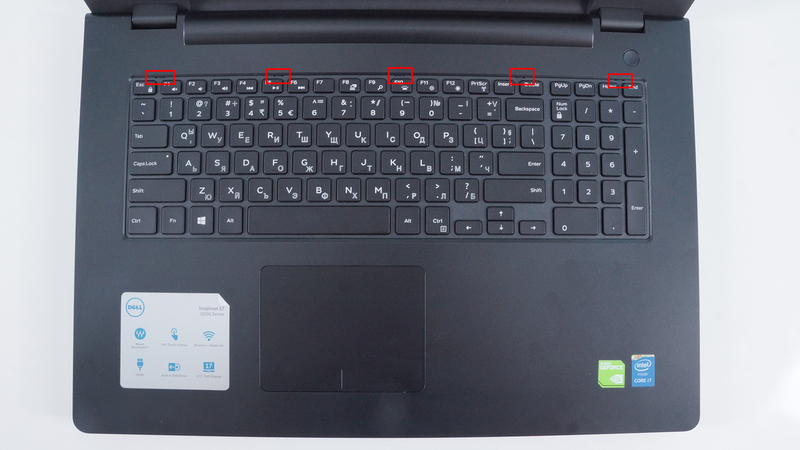 To remove the keyboard you will need a soft plastic tool (so that you will not damage the keyboard) and you might want to start from the top of the keyboard. After you’ve finished removing the screws beneath the keyboard, you can start displacing the main chassis, which will reveаl the motherboard, as well as the CPU fan. If you want to remove that too, you will have to unscrew 3 bolts, which are highlighted below. Keep in mind that there are a few cables you will need to take care of before removing the motherboard. 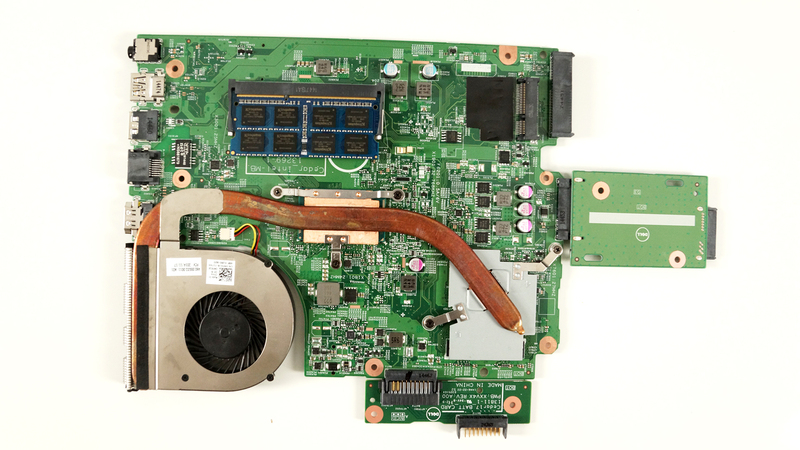 Dell has used only one heat pipe for the cooling system, which might be enough considering the not so powerful and power-hungry CPU, which in our case is Intel Core i7-5500U, but still the plate and the heat pipe seem large enough to handle well the temperatures. Also, the grill for dispersing the heat is big enough to handle the extra digits of temperatures. But to be absolutely sure, we have to test it and this will take place in our upcoming detailed review.